We explore how lipstick improves our daily lives and if it really is as powerful as we believe. Executive director of Women for Women, Brita Fernandez Schmidt, reported that during a visit to Bosnia, founder Zainab Salbi asked the women what they wanted her to bring them on her next visit – their answer was “lipstick”. 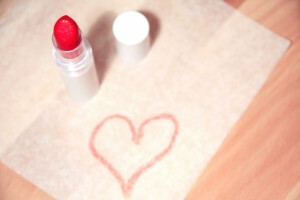 “Lipstick has the power to give women confidence and hope all over the world. It’s what I call the psychology of make-up – when you look good, you feel good. When you’re at your most confident, you can unlock your power on the world.” says Tilbury. This is the theory that during an economic recession, lipstick sales will continue to rise. During the 1999 to 2000 recession for example, lipstick sales increased by 4%, while appliances, home furnishing and clothing fell. While some researchers claim this is because women are “wired” to seek mates during tough times (lipstick will make them appear more attractive), while another theory is that women like to feel beautiful, strong and confident when times get tough. Suffragettes, Elizabeth Cady Stanton and Charlotte Perkins Gilman wore red lipstick as a form of emancipation and women wore a bright red shade across their lips at the rallies thereafter. This was a way for women to rebel by wearing a colour many social or religious groups found distasteful. Individuals also wore lipstick as a form of rebellion in the 1970s. During the punk-rock movement, they would wear deep plum shades as a way to express their sexuality. The 1970s also saw women not wearing lipstick as a way to condemn the beauty market and the alleged degradation of women. According to US poll, 81% of women say they wear lipstick regularly, while only 64% admit to using foundation. It has also been reported that every year, almost 900 million tubes of lipstick are sold worldwide. In the US, it is estimated that women will purchase eight tubes of lipstick each year. Is that number close to your lipstick habits? What is your favourite colour to wear? Do you feel strong and confident when wearing it? What else makes you feel confident and strong? Visit Beauty Resource to find a beautician near you and treat yourself - you deserve it!